We have gained recognition as an eminent enterprise, devotedly engaged in manufacturing and supplying a broad range of Toilet Seat Sanitizer. - Used for cleaning the toilet. As per the requirements of clients, we are providing excellent quality Toilet Seat Sanitizer. Just spray on the toilet seat before using to sanitize it. · Disinfects toilet seat and direct contact areas like Knobs, Taps, Flush Handles etc. Safety First Sanitizer Spray is the ideal personal Hygiene solution when using washrooms in public areas such as Theatres, Restaurants, Airports, Air Planes, Trains. Our organization is ranked amongst the reputed names in the market for providing Toilet Seat Sanitizer. Furthermore, we present this at nominal prices. 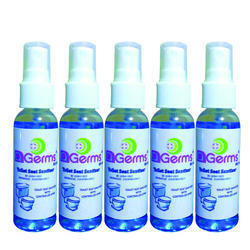 Cleanseat-Toilet Seat Sanitizer Spray is here to ensure a Safe & Germ Free Toilet Experience.